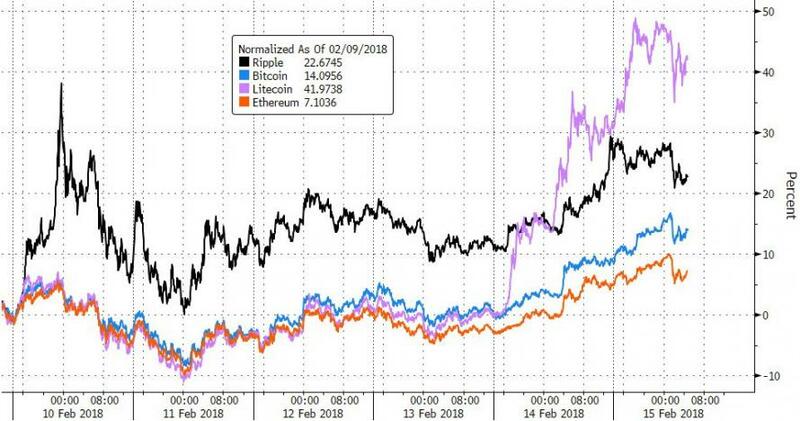 Cryptocurrency prices are surging again this morning with Bitcoin testing $10,000 for the first time in over two weeks. 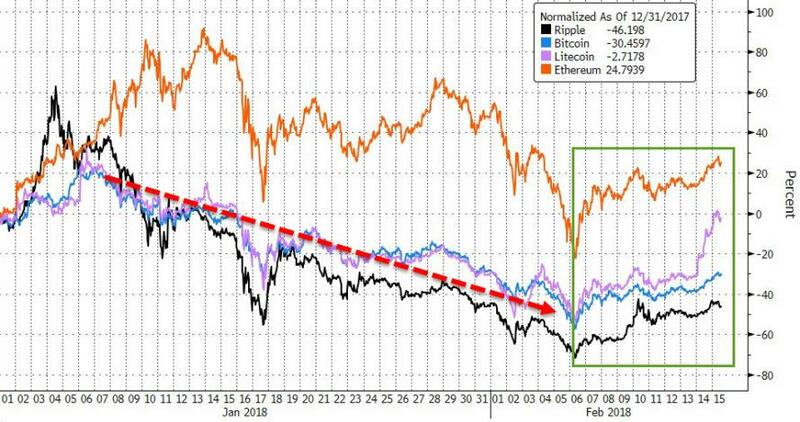 While Bitcoin remain down 30% year-date, it appears that amid the recent cataclysmic collapse of Bitcoin, the cryptocurrency hammered out a low earlier this month, as dip buyers scooped up coins below $6,000. Nearly eight days from the low, the auction has soared by more than 50 percent probing a 20 simple moving average at 9,162. According to BitInfoCharts, a mysterious buyer with a Bitcoin address of 3Cbq7aT1tY8kMxWLbitaG7yT6bPbKChq64 purchased an astronomical amount of bitcoins worth $344,000,000 at a blended cost basis around $8,400 from 02-09-18 through 02-12-18. In total, this Bitcoin whale doubled down adding nearly 41,000 coins for a new total of 96,000 coins worth somewhere around $900,000,000 at today’s price ($9,400). Bitcoin address 3Cbq7aT1tY8kMxWLbitaG7yT6bPbKChq64 is number three on the top 100 richest Bitcoin address in the world. The table from BitInfoCharts reveals the centralization of Bitcoin wealth. 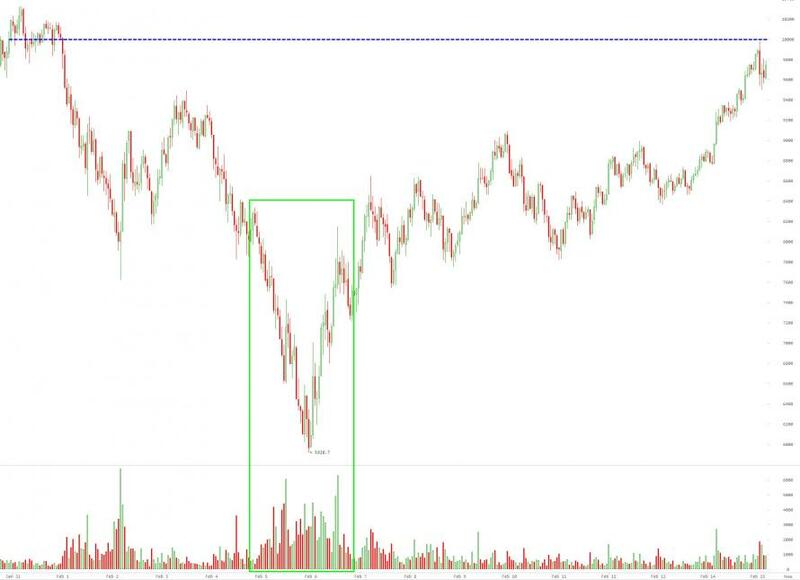 Last night, we reported how South Korea officials downplayed the threats of a ban, which has sent Bitcoin well over +11 percent since to 9,400-handle. The catalyst for the leg higher appears to be South Korea once again as regulators downplayed any threats of a ban. As Bloomberg reports, South Korea’s government gave the strongest signal yet that it will allow cryptocurrency exchanges to keep operating in the country, a welcome development for traders who had feared an outright ban in one of the world’s biggest markets for digital assets. Policy makers will focus on making cryptocurrency trading transparent rather than outlawing it altogether, Hong Nam-ki, minister of the Office for Government Policy Coordination, said in a video a posted on the presidential website. It was the government’s first coordinated response to the public uproar over a justice ministry proposal in December to shut digital-asset exchanges.